After Muqtada Al-Sadr's Surprise Win, Iraq's Political Leaders Try To Form Government : Parallels Two weeks after parliamentary elections delivered a surprise win for allies of Shiite cleric Muqtada al-Sadr, Iraq's divided political leaders are scrambling to put together a coalition government. 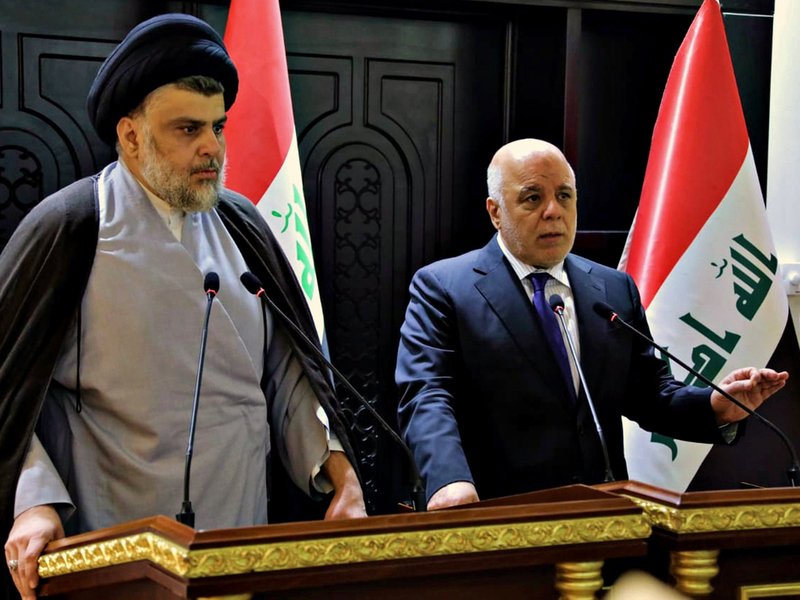 In this photo provided by the Iraqi government, Iraqi Prime Minister Haider al-Abadi (right) and Shiite cleric Muqtada al-Sadr hold a press conference in Baghdad on May 20. Sadr's coalition won the largest number of seats in Iraq's parliamentary elections. Iraq's first post-ISIS elections were among the most peaceful since 2003. But they have been marred by serious allegations of fraud in the disputed city of Kirkuk and the Kurdish city of Suleimaniyah. Sadr, who has transformed himself from a feared militia leader to a populist, nationalist politician, has been at the center of the negotiations. He holds no official political position and, according to aides, has no interest in being prime minister. But he has channeled his revered religious family's traditional base of poor, disenfranchised Shiites into a much wider alliance. And in promising an end to patronage and party quotas, he has in many ways set the agenda for Iraq's next government. Sadr has promised a government of technocrats that would deliver public services largely lacking for the last 15 years. "Iraqi people are fed up with the old politicians and they want the new systems, the new people and the new styles to work with," Sadr's spokesman Sheikh Salah al-Obeidi told NPR at the party offices in Baghdad. "We are looking for a new kind of government. We have the main outlines of this program and we want to discuss with the other parties how to make a full program." Obeidi says while previous governments have chosen a prime minister and cabinet ministers on the basis of party loyalty, a new government would agree first on a reform program and compile a cabinet qualified to carry it out. Political leaders in the flurry of late-night meetings in Baghdad have signaled their intentions through photo ops and tweets. One tweet by Sadr, never previously known for his levity, used a play on words to indicate that his political bloc could partner with almost everyone apart from former prime minister Nouri al-Maliki. "Maliki himself is responsible for many of the disasters that came to Iraq so it is difficult to accept him," Obeidi said. The bitter history between Maliki and Sadr includes Maliki sending Iraqi forces to take back Basra from control of Sadr's Mahdi Army militia in 2008. It also includes what is widely viewed as Maliki's deeply sectarian policies in his second term after 2010, which is blamed for contributing to the rise of ISIS. Sadr's Mahdi Army militia fought U.S. troops after the 2003 invasion of Iraq. They are blamed for fueling Iraq's civil war, including sectarian cleansing of Baghdad neighborhoods. Sadr's advisors explain his transformation into a pan-Iraqi leader who has reached out to Sunnis, secularists and minorities by saying that these are different times. As prime minister and chief of staff, Maliki ordered mass arrests in sweeps of Sunni towns and cities. Political favoritism and corruption in the Iraqi army was so endemic, entire army divisions collapsed rather than fight ISIS in 2014. Obeidi, though, leaves the door open for a coalition that could include paramilitary commander Hadi al-Amri's Fatah political bloc, made up mainly of pro-Iranian militias — and even Maliki, if his political bloc signs onto a program of government reform. Fatah won 47 seats and Maliki's political bloc won 26. Obeidi predicts that forming a coalition with enough seats to govern could be done in two weeks. In Iraq's fractured political landscape, attempts to form previous governments have taken up to six months. And although Sadr's bloc won the biggest number of seats, there is nothing to preclude another grouping coming together with more seats, leaving the Sadrists in opposition. In recent weeks, Sadr has made a point of meeting with diplomats in Baghdad, including the Turkish, Spanish and Syrian ambassadors. In the past, his officials have met Australian diplomats, despite that country's involvement in the U.S.-led invasion in 2003. Obeidi says Sadr would draw the line, though, at meeting American or British envoys. "I think it is very difficult," he says. "As [far as] I know, Sayid Muqtada Sadr still thinks there are many problems to have such a step with American officials." (Sayid is an honorific denoting a descendant of the Prophet Mohammad). Still, previous government ministries run by the Sadr movement cooperated with programs involving the United States, Obeidi points out. And Sadr has not objected to existing agreements for U.S. troops to play an advisory role in Iraq. "Fixed American army bases inside Iraq are a problem for us," he says. "But when [current prime minister Haider al-] Abadi made a decision to bring American soldiers to Iraq, Sayid Muqtada Sadr did not stop his support to al-Abadi because he understands that al-Abadi made such decisions in order to help Iraq." Obeidi points out that Sadr also rejects Iranian interference in Iraq. Sadr has not publicly met with Iranian military commander Qassim Suleimani, who has also been in Baghdad for talks since the election. Suleimani "will not give up trying to use his influence, but at the same time, it is up to Iraqis to stop this," he says. "From Sayid Muqtada Sadr, he refuses such influence not only from the Americans but from the Iranians. Maybe a kind of advice here and there — but interference is refused." Sadr so far has indicated he is ready to partner with Abadi and Ammar al-Hakim, another prominent Shiite leader who previously headed the Islamic Supreme Council of Iraq, a major political faction. Abadi and former prime minister Maliki belong to the same party, but they created separate political blocs for this election, a move that is seen as contributing to Abadi's relatively poor showing in the polls – just 42 seats. And despite their differences on Iran, Sadr has met with Amri, the head of Iraq's popular mobilization forces – mostly Shiite militias assembled to fight ISIS. The participation of Fatah in a government coalition is seen as likely to increase Iranian influence in a governing coalition, but it is clear that all parties are keeping their options open. Kurdish politicians, who among them hold more than 45 seats in parliament, have also come to Baghdad for talks on joining a coalition. Districts hotly contested by Kurdish political parties have prompted the most serious complaints of fraud, and some of the seats are in dispute. In Kirkuk, Arab and Turkmen parties alleged Kurdish parties had tampered with the counting and staged sit-ins outside election centers. The politically appointed head of Iraq's election commission asked for security forces to be called in, saying his workers were being held hostage. He was later publicly reprimanded by Prime Minister Abadi, who warned election officials not to make unsubstantiated statements. In the Kurdish city of Suleimaniyah, Kurdish opposition parties accused the Patriotic Union of Kurdistan (PUK), the dominant party in that province and one with close ties to Iran, of tampering with the new, automated ballot-counting system. Opposition parties have said the results from some specific polling centers where candidates voted for themselves didn't reflect those votes. The allegations have been serious enough for the United Nations to publicly urge the Iraqi government to investigate. Iraq's national security council has told the Iraqi cabinet that the new automated system, designed to eliminate fraud and rushed into use for the elections, could in fact be relatively easily hacked. "I know the imperative for many of the international powers is to move to the government formation process," rather than thoroughly address the allegations of fraud, said Barham Salih, a former Kurdish prime minister who broke away from the PUK to form a new party, the Coalition for Democracy and Justice. He called on countries though that had encouraged Iraq's transition to democracy to help ensure the elections were fair. "The promise of Iraq's liberation in 2003 was to give people a voice, a vote," he told NPR. "This is not a good day for democracy."